Wow. They had a lot of issues, didn’t they? A lot of sites are chattering about the article in this month’s Atlantic on Hillary Clinton’s campaign. Joshua Green was able to get a hold of internal memos from clashing factions, and plot a very good timeline rife with shifting priorities, competing strategies, and decisions that languished far too long. ‘Two things struck me right away. The first was that, outward appearances notwithstanding, the campaign prepared a clear strategy and did considerable planning. It sweated the large themes (Clinton’s late-in-the-game emergence as a blue-collar champion had been the idea all along) and the small details (campaign staffers in Portland, Oregon, kept tabs on Monica Lewinsky, who lived there, to avoid any surprise encounters). The second was the thought: Wow, it was even worse than I’d imagined! The anger and toxic obsessions overwhelmed even the most reserved Beltway wise men. Surprisingly, Clinton herself, when pressed, was her own shrewdest strategist, a role that had never been her strong suit in the White House. But her advisers couldn’t execute strategy; they routinely attacked and undermined each other, and Clinton never forced a resolution. Major decisions would be put off for weeks until suddenly she would erupt, driving her staff to panic and misfire. Though campaign reform is on everyone’s mind, rhetoric and political assaults swing the other direction, especially with a heightened media presence. Does anyone else feel a tinge of schoolyard insults in this year’s election? 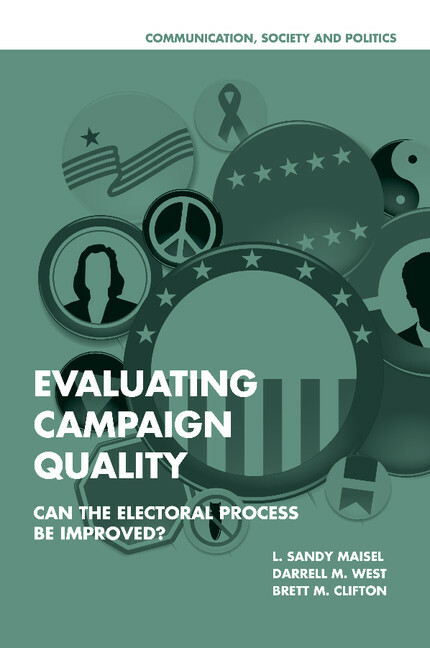 Evaluating Campaign Quality looks at reforms that have been put into place in various states, and whether they actually work.